What is something that everyone loves? It would have to pass the test of time and prove to remain relative as the years go on. Hmm, well one thing that comes to mind is an adorable doll. Dolls have been around for centuries. Even in ancient Greece children were recorded having played with dolls. Although no one has ever seen a doll as cute as your little one dressed up in the Baby Rag Doll Costume! People could travel all around the world looking for a doll that will be as cute as your kiddo in this outfit but their journey would prove to be a failure. There is no China doll that could be as cute, no puppet will be as playful, and no teddy bear could ever be as cuddly as your new little rag doll. 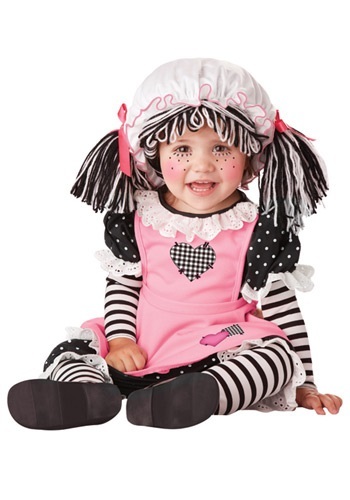 Your baby girl will transform into a mini gothic dolly once you dress her up in this lovable outfit. The cherry to top off this endearing costume is an adorable pair of white and black yarn pigtails attached to the pink bonnet. If you really want to doll up your baby this Halloween than give her a quick makeover and make her look as precious as a storybook character! Bring your new limited edition Baby Rag Doll around the block to collect piles of sweet treats or visit some intriguing doll expos. Just make sure not to leave your bundle of joy alone for even a second, the last thing you want to deal with is a collector mistaking your cutie for an actual rag doll!